It’s shaping up as a strong offseason if you need a No. 2 wide receiver or slot receiver in free agency. Hopefully, DeSean Jackson is is cut and hits the market. But there are many other big names and standouts with expiring contracts. Golden Tate might be the best slot receiver in the game, and he’s a former Pro Bowler with a Super Bowl ring. John Brown, an old friend of Bruce Arians, still has speed and is coming off a good season with Baltimore, even with their shaky passing attack. Tyrell Williams anyone? He’s a taller version of Chris Godwin with more catches under his belt and 94 yards receiving in a playoff loss to the Patriots last week. And there’s a slot receiver named Humphries, among others. Adam Humphries is beloved by the Bucs. General manager said two weeks ago the Bucs would do whatever they can to keep him. New head coach Bucco Bruce Arians doubled down on Licht’s comment yesterday on The Adam Schefter Podcast. Schefter asked Arians what he likes about the Tampa Bay receivers because he seems so excited by them. In the box score of the game Arians referenced, Justin Watson caught a few balls, one for 18 yards, so Joe assumes he’s one of the young receivers Arians referred to. Bobo Wilson didn’t catch a pass, though he’s likely the second of the “young kids” deep on the depth chart. “They’re just loaded up,” said of the overall talent at tight end and receivers. But the Humphries comment is telling coming from Arians. If the Bucs lost Humphries to a more attractive offer, is it possible Jackson could return and rotate slot and outside duties with Godwin? Jackson told Schefter a couple of years ago that he sees himself as transitioning to the slot later in his career. No, Joe doesn’t want Jackson back for $10 million over Humphries, just something to consider as Jackson enters a contract year. Only a fool wouldn’t want Hump! Golden Tate is as tough as they come. I would definitely sign him. Need to re-sign Hump. Injuries happen and if Evans and Godwin go down we don’t look so lethal at WR. That’s my man!!! Way to go Coach. I knew you would like Humphries. I’m feel indifferent with Adam. I want him back as a Buc, he’s one of my favorites(I’ll forgive his one fumble). On the other hand I be pretty happy for the guy if somebody want to overpay and give him 30M. I do say overpay lightly because Adam has earned every penny. I’d love the Bucs to overpay him but it probably won’t make biz sense. Hump has the best hands and quickness on the team and is up there with the best slot receivers in the league. Won’t stop working for W’s after fat contract. Gotta get him back. Now coach go meet my main man P. Barber. Your gonna love him. He is the pure definition of “bruiser” in this league!! If my coach doesn’t want a bruiser on his team I don’t want that coach. P.Barber gonna finish his career in TB behind 3-4 separate feature backs and will churn out over 4,000 by the time it all said and done. Barber also got the best jersey too. I don’t think Jackson has the balls to play slot. He won’t go across the middle of the field and take that big hit. Time to cut bait with him. what game are you watching ?…the DB’s are not allowed to hit like that anymore…. Pay Hump. Dude is money. if tyrell williams and adam are asking for the same $$$, i would go with williams…dude is a beast and at 6’5 can run a 4.4….more versatility with williams….but i love hump….his work ethic is 2nd to none…..
We haven’t even gotten to the conference championships and I’m jonesing for Buccaneer football. It’s a Bucs life. MeJax has to go. When your team wins and you are pouting and runningnoff the field, you are not a team player, no matter what you say. Bruce Arians says everyone had to have one common goal and that is win a ring. MeJax’s only goal is to get his stats, he does not belong on this BA team. Hump is a beast in the slot, and has great rapport with JW. I could see him getting a 4-5 year 7M/yr contract. He would be well worth it too. If anyone wants to go higher, I think he slips away. I’m a Golden Tate guy, he has some Steve Smith in him, but his tag might be a bit much for us. Plenty of speedy guys possibly available next season like Tavon Austin, John Brown, Cordarre Patterson, JJ Nelson, Corey Coleman, Chris Conley, and Mike Wallace to name a few. Sorry MeJax, you’ve been tolerated long enough. Now it’s time to replace you. The last thing this team needs is to go out in free agency to get receivers, resign Adam and develop the young guys which is why such a big coaching staff is here. The media is the one starting the narrative that we need to go the Lovie route and turn this into the Tampa bay cardinals. The needs are on the line on offense only even if d jackass leaves. Justin Watson has speed, Bobo underachieved because the entire stadium knew he was only used as a decoy in that stupid fake. Keep Humphries, dump Djax and sign John Brown……..
Then coach them all….problem solved. Please get rid of Diva Jax and keep Hump!!! It was thanks to Koetter that his skills were recognized. Lovie didn’t see his talent to make the active roster. Who returned kicks when Diva Jax didn’t want to? Hump. Who consistently caught balls and stays healthy? Hump. Who is a team player and model NFL sportsman? Hump. Can’t say any of that for Diva Jax. But you can say that he wanted to be traded and didn’t want to be a part of the team. Heck, Fitz said it himself when Diva Jax was gushing over him, that in his experience receivers really like you when you get them the ball, and they don’t like you when you don’t. He knew where that was coming from. If the Bucs cut D-Jax and don’t trade him, they’re really really stupid. Who consistently had awful punt returns that would put the offense starting inside the 10 yard line? Hump. Who would consistently fumble the ball away, including single handedly losing games, that would be Hump. Who would bring the offense to a halt when pushed into a starting position? That would be Hump. Hump is a really good #4 WR. He’s an average #3 WR. And he kills the offense if he’s in the role of a starter. He’s also a bad punt and kick returner unless it’s in the preseason when it doesn’t matter and he’s playing against future Burger King employees. The Bucs should keep Hump so long as they don’t break the bank and they keep his role in check. As a #4 WR he offers the team a big advantage since he’s going against safeties, backup corners and LBs and his limited physical skills aren’t standing out – but higher of the depth chart his limited physical skills shine and his usefulness drops off the map. BTW who is an excellent kick returner? That would be Bobo, who was one of the top kicker returns in the league last year and people seem to not know that. I’m still a big believer in that Bobo can step right into that #4 spot and can be productive, then again Bobo, if he hasn’t matured, could talk himself straight off the team. Anywho the Bucs should try to keep Hump, so long as they’re not paying top #3 money. If they can get him for middle of the road #3 money, then make it happen, but $7-9m for a #4 WR? Wow, that’s an expensive roster you’re building. Arians wants **everyone**. Everyone except GMC it seems. 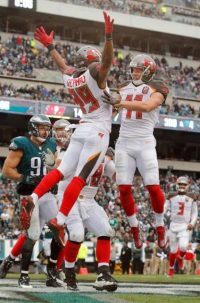 Dear coach BA, please convince One Bucs to keep: Mike Evans, DeSean Jackson, pay this great guy that we rarely got chance to have named Humphries, Chris Godwin, and trade James Winston. Bleacher has rated as third best receiving free agent behind golden gate and Larry Fitzgerald who will probably retire. so who does number 2 work for ? Hope BA reads your post and takes that advice! We’ve got a surplus at WR. Justin Watson may just be the best pick of our draft last year. Of course BA wants hump back. He’s the most underrated slot receiver in the game. Tough as nails and very dependable hands. Godwin will grow up mentally just Evans did. I like having D-Jax on the roster but if it holds back the rest of our talent I’d let him go. Rod Munch, not sure what games you were watching. Hump has one fumble his entire career. Try to get your sh!t straight before you start talking BS on a very serious situation. SOEbuc – He fumbles like every other punt return, then picks it up after losing 15 yards and puts the team at the 1 yard line. If memory serves correct he literally did that twice in the Cleveland game alone. Guys, Hump is a good DEPTH WR… he stinks as a starter. When you give a guy big money, even as a #3, guess what, he’s one injury away from starting. Hump gets completely shut down by starting CB’s, it’s literally why they don’t start him. If he was so good, then why was he 4th on the depth chart? He’s a great underneath guy and that’s how the Bucs have generally used him. That doesn’t mean he’s a bad WR, he’s just not a guy you give $7-9m to because you can’t start him without killing your team. As far as the market goes for him, we shall see. I don’t think there’s anyone giving him $9m a year, but then again, it only takes one GM to do it, so perhaps it happens. If he’s gone next year because someone did give him huge money, and he’s only getting huge money if someone sees him as a starter, then watch as Bobo steps in (assuming he doesn’t get himself cut) and plays the role of Hump nearly flawlessly. Hump is a very good player for his spot on the roster – he’s an advantage against the defense as a #4 WR, but he’s looking for #2 WR money, and I can’t see the Bucs being that dumb to pay it to him when they’ve seen him produce nothing when he was pushed into that #2 role. He may not technically be a number 2 receiver but let’s face it he’s the second best receiver on the team. you guys are hilarious. you are talking about a slow boring white guy… how many of those win Lombardi’s… dude was undrafted for a reason LOW TALENT CEILING!!! every bucs WR and their morning feces has more talent and upside than mr hump was born with sorry but the truth hurts. no one falls in love with mediocrity like a conservative bucfan who is deathly afraid of change or explosive plays. Hump would likely knock off a mill for cool new jerseys. let us face it hump is the least talented with the least upside in the entire team not just WR room. he was undrafted for a reason. he scares no one but low standard bucfan. no one loves a no talent player like a bucfan. I hear that. And I wouldn’t be mad about it at all. Hump, GMC, Db!tch, Kwon, VH3, DSmith. Bring in two cheaper average/above average vets for every one of those players they dropped. Depth and Defenses win championships. LVD has still dominated on every one of these sh!tty defenses through the years so we’re gonna keep him and see what he can do with a what could be a great defensive coaching staff. No one knows anything about our new defense so far, but draft Ed Oliver if he’s on the board at five. Nassib, Vea, Oliver could be a speed boat dline for at least the next 7 years. Give Leidtke the LT position. Draft a OG in the second round. Pay Patrick Peterson and a good (doesn’t have to be All-Star) RT. How many first downs did Humphries get this team when we needed it? Too many dumb fans who think speed is more important than production. Steve Largent went to the HOF because too many DBs thought he was slow but couldn’t cover him. He is an over the middle fearless receiver, doesn’t need to have the fastest 40 time. By the way, we have a track star on our team in Jones, how that working out? And complaining about Hump returning punts? Why don’t you ask MeSean why he didn’t go back and do it? Hump is money. He is the QB’s security blanket too considering he can’t throw a consistent deep ball, but yeah lets let him walk over a million or two. Slot receiver is what makes the Patriots engine run, and has for years. If Adam Humphries was on the Patriots he would be a household name. Also he ran a 4.53 which isn’t slow for a slot wr. But then again who expects tmax to know anything about football. Humphries has big games when other receivers are keyed on by defenses and Bucs generally lose those games. He is a good player, but is not fast. Bucs have Watson and Bobo who are both faster, but Bobo is a little small. If Bucs cut ties with DJax, Watson and Bobo’s speed will be needed. Just out of curiosity I note Golden tate is a ” former Pro Bowler”. However Winston is a “Pro Bowler”. Exactly how does that work? Sorry TMAX, can’t agree with you this time. Hump’s a poor man’s version of Edelman, has hands of glue, and fits perfectly as an top-shelf, underneath slot receiver. No one’s asked him to be a deep threat or climb the tree downfield, nor is that what he’s built for. That doesnt’ make him low ceiling talent. Instead, he’s a perfect fit for a needed position and is one of the best at it too. Oh yeah, and being white has nothing to do with it. @Duthsty … “hump wont be back, arians flippin this roster and going to build that crappy defense that licht has failed to build.” Not sure at this point about Hump making it back, but the idea of Coach Arians “flippin this roster” intrigues me Duthsty. So did a little research on Spotrac to see what our 2019 Salary CAP situation looks like. One word … YUCK! Right now it lists 54 on the roster (almost half of them I’ve never even heard of … many were recent signings it appears). The Bucs 2019 Adjusted Salary CAP number apparently sits at $191,485,957. Right now Bucs sit at $182,706,551 for all contracts plus dead money (only $96,744 fortunately). That leaves us with $8,779,406 to play with. I say again … YUCK. Interestingly, when you add up the Top-10 players already under contract (Jameis, ME13, JPP, GMC, DJax, Marpet, Jensen, LVD, Curry & Brate), they ate up very close to two-thirds of the salary CAP (actually 64%). When 18% of your roster eats up 64% of your salary CAP, it seems pretty obvious that freeing up money for adding veteran FAs to meet some of our biggest NEEDS will require doing ‘something’ with several of those Top-10 players and their salaries. Just a guess, but gut feel is that at least 3 & maybe 4 of them won’t be with us some this fall. Even with some of those ‘adjustments’, adding big-money FAs probably won’t be in the cards for this year. Bruce Arians has good taste. @altered: what game am I watching? 🤦🏻‍♂️ smh. I guess they have zero fear of taking hits to the knees while going across the middle. I remember watching Cecil Shorts being carted off the field in San Diego with a serious knee injury. we absolutely MUST re-sign Humph. Get rid of djax, that guy is the antithesis of what we need right now in terms of attitude and effort. Didn’t Golden Tate sleep with Russell Wilson’s wife? That’s why they traded him to Detroit and Russell got a divorce. Not really the type of guy you would want on your team. what if they let humphries and djax go, and sign golden tate? also the bucs were high on that kid who got injured in training camp…he was definitely unseating all the 6th receivers you regularly mention joe…i forget his name…that’s the guy the kangol kid is referring to.. I think we all want Adam Humphries back on this team. Very under rated player.